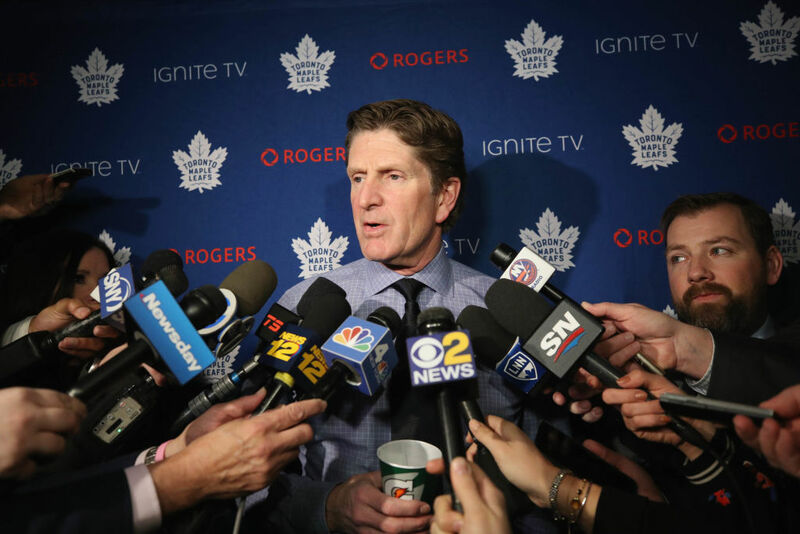 Mike Babcock was in the middle of a media storm in Toronto last week (Getty Images). MONTREAL -- You could feel the tension all around the Toronto Maple Leafs when they arrived in KeyBank Center on Wednesday. And don't think it went away just because of their dominance over the playing-out-the-string Sabres either. Denials aside, there is something bubbling between coach Mike Babcock and General Manager Kyle Dubas. Babcock tried to lessen it when speaking to reporters at home Friday but it will be a narrative the rest of the way. And just wait if the Leafs are quick knockout victims in the first round of the playoffs at the hands of the Boston Bruins again. There are plenty of folks in Toronto talking about Babcock's status like we talk about Phil Housley. Seriously. "I go to the media, what, twice a day? Sometimes three times a day it seems like," Babcock said. "There's gonna be a (bleep) storm once in a while. There just is. You'd like to say everything perfect, and sometimes maybe you don't." Keep in mind, the Leafs got to Buffalo off a 3-0 loss in Nashville the night before that dropped them to 1-4 in a five-game stretch which saw them give up 26 goals. So what was that storm about? Babcock had mused a couple days earlier about his club's depth, because his team is paper thin on defense with the losses of Jake Gardiner and Travis Dermott, and Kasperi Kapanen was out four games with a concussion. "You’re way better when you have all guys on deck,” Babcock said. “The thing about a team is you have 23 spots on it and you have a minor-league team, you’re supposed to build the best program you can to have as much depth so you don’t miss people. The Toronto media, naturally, ran with those comments to the point Babcock had to walk them back on Friday. “If there was any slap at anyone, it sure wasn’t intended. That’s not what I meant to say,” Babcock said. “We have to keep improving our depth. That’s what Dubie is trying to do ... we’re all trying to do it so we can get to be like these [other] teams. Fair enough. But you wonder how much time Babcock gets if things go south in the playoffs. Frankly, the Leafs look like heavy underdogs to Boston right now and feel desperate to win a series for the first time since 2004. Forgot about that little issue of no Stanley Cups since 1967. It's widely known Babcock isn't a fan of backup goaltender Garret Sparks, whom Dubas kept on the roster this year while putting veteran Curtis McElhinney on waivers. It was a mighty curious move if the Leafs were supposed to be going for a Cup. Sparks has struggled (8-7-1, 3.16/.903) while McElhinney has thrived in Carolina (18-9-2, 2.59/.913). So it was a big story in Toronto when Sparks sounded off about his team's lack of emotion after last week's 6-2 loss in Ottawa. When the Leafs got to Buffalo Wednesday, Sparks was a talking point for Babcock. Were Sparks' words going to create more pressure on him? Sparks came through with a couple key saves in the Leafs' 4-2 victory. None bigger than stopping a Johan Larsson breakaway in the first period with the game scoreless but the Leafs holding a 17-2 advantage in shots on goal. That calmed things down some but the ultimate result will determine Babcock's future. Does the coach survive, especially with Joel Quenneville and Alain Vigneault among the coaching candidates on the market? Remains to be seen. And for the legions who constantly pepper social media with Quenneville-to-Buffalo talk, Toronto is a far more attractive destination with a much more ready-made team. The Leafs' sideshows are always fun to watch. This one is par for the course. Embattled Senators owner Eugene Melnyk, who has never met a microphone he couldn't say something stupid into, joined the Leafs fray Friday during a rare appearance on Ottawa radio. While it's certainly unbecoming for an owner -- especially one with as little credibility as Melnyk -- to diss another team, he's not far off here. It doesn't look like the Leafs are going to have cap space to retain Gardiner and that's a real problem because of the lack of organizational depth on the blueline that Babcock referred to. Dubas thought he addressed that by acquiring Jake Muzzin from Los Angeles. And while Muzzin adds a physical element, he's admitted it's been a struggle getting up to speed with the lightning-quick pace of the Easterm Conference. The Capitals are headed to the White House Monday to be honored by President Trump for winning the Stanley Cup. As you might expect, not all of them are attending. On Friday, goalie Braden Holtby became the biggest name to beg off, joining teammate Brett Connolly and former teammate Devante Smith-Pelly, now in the AHL, in declining the invitation. The team accepted the invite and allowed each player to decide if they would attend. Most have decided to go, including captain Alex Ovechkin. “I’ve got to stay true to my values, and I’m going respectfully decline the offer,” Holtby told Caps reporters. “In saying that, it’s a tough situation for everyone to be in, to be forced to make a decision of that standing. You’re a team and you want to stick together no matter what, so I hope everyone kind of blows it away and that we don’t worry about who goes and who doesn’t. “For me, it’s just a personal thing. I believe in what I believe in, and in order to stick to those values, I think I have to do what I feel is right, but that doesn’t make a difference on everyone else’s decision. We stick by every single teammate we have and their decision." Connolly joined Smith-Pelly, who is black, last year in saying he would skip a White House visit with Trump. His views haven't changed. “I respectfully decline,” said Connolly, who is Canadian. “That’s all I’ll say about it. Everyone is entitled to their opinion. It’s obviously a big deal, and it gains a lot of attention. I’ve been in full support of an old teammate that I’m really good friends with who I agreed with." * A gauge of how far the Sabres are from even making the playoffs: One of the Hurricanes, Blue Jackets or Canadiens are missing the postseason. And all three are pretty good teams, far ahead of Buffalo on the progress scale. * The Sabres really need a deep run from the Rochester Amerks in the Calder Cup playoffs. The numerous problems at the NHL level can be soothed a little by the ability to keep pointing to playoff success in Rochester. If the Amerks flame out early, it's going to be hard for Jason Botterill to reach back for any success stories this season. * Even with the Sabres out of playoff contention, there's still a lot of intrigue and intensity when playing teams like Toronto, St. Louis, Pittsburgh and Montreal because they're either prepping for postseason or in their desperate push to get there. Had they been pushing for a spot, the schedule maker (finally) gave the Sabres a break . Too bad they're not. Because now we're subjected to four games against Detroit and Ottawa over the season's final two weeks, starting Tuesday night in Canadian Tire Centre. That quartet doesn't figure to be must-see TV.